Enriched Geranium: Happy Fifth of July. It's almost over. As I write this, it's almost midnight on the fourth. The dog is cowering upstairs. The major fireworks displays have ended but people around the city are still celebrating with their own fireworks. Soon it will be time to call the cops (just kidding). I used to love the fourth of July, mostly because of the fireworks. It is now one of my least favorite days of the year. I find the American flags and jingoistic, patriotic rhetoric too upsetting. Once, a number of years ago, some people I know were assisting a family of Guatemalan refugees (I don't know for a fact that they were Guatemalan, they were using false names and may well have been from a country other than Guatemala). They stayed in Madison for a little while, I assume because they needed a safe place to stay while they were waiting to be admitted into Canada. They happened to be in Madison on the Fourth of July. They came to a family picnic, followed by the local fireworks. The Guatemalan children freaked. Their parents also appeared to be distressed. What were pretty lights in the sky for the rest of us were too much like the sights and sounds of actual war for them, and they had lived through it. Now I can't go to fireworks without thinking about the fact that what we're doing for entertainment represents death and destruction for so many other people, often at the hands of "our" government. (I use the quotation marks there because they're not really ours. They're Halliburton's government, Walmart's government, Monsanto's government, but not ours.) Then add the flag waving, fighter planes flying overhead and God Bless America blasting everywhere. Ugh. Not a day of celebration, in my opinion. Anyway, happy Fifth of July! I share your feelings about fireworks, especially the loud, no color, just loud noises to make little dicks feel bigger. Booze and explosives! what a freaking stupid way to celebrate something that is supposed to be important. What a great post Ed... thank you. 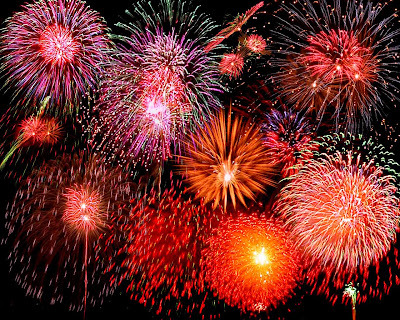 Please see Johnieb's post about fireworks, patriotism and why he is not ever at peace around loud noises. We went to a small Vermont town fireworks display last night with some of the family. As we were sitting on our blanket on the grass people watching, I followed a large, extended Indian family walking by and wondered how they had ended up in Vermont and what they were making of all of this. I mean, there were about a dozen of those inflatable recreation monstersoties, a few food fenders and the pending fireworks. I thought it was odd; nevermind people of a different culture. I realize there were perhaps more meaningful things happening in other places but across small-town America, I'm sure this was quite typical. Is this all we have to offer? Thanks, Franiam. I was unable to get to Johnieb's post via that link, but I think I found it here. Thanks for sending me that way. While I don't have any way of knowing what it would have been like to experience something like that, I think I can understand why he wouldn't find fireworks or loud noises to be enjoyable. Hello, Pagan. Although many countries have their own similar holidays, I wonder what it's like for someone from another country to be in the US on July 4th, not to mention other holidays. As far as meaningful events happening in this country, I sometimes question if they ever take place. I frequently doubt if the majority of people in this country (Warning!!! GGA! [Gross Generalization Alert!]) ever really think about anything more meaningful than American Idol. Yes, the comments of that family (here because of the Sanctuary Movement during the reign of the insane Anglo warlord) made a deep impression on me as well. I also remember being at a parade on the Square when Cinderbelle was a toddler -- I think it was celebrating our glorious vanquishment of Saddam Hussein the first time -- and being frightened by the fighter jets, plus furious at all of our "liberal" politicians standing on the f*cking floats. By the way, I wanted to be the first to wish you an early happy Sixth of July! Back at ya, although I'm a day or two late. I'm with you on this, Ed! After coming back from Nicaragua, from witnessing the contra war on my trip during the fall of '87, fireworks were, like you mentioned, a constant reminder of "my" tax dollars at work. I saw fireworks of sorts in Nicaragua. The night sky would be filled with flashes and explosions. Falling asleep to the sound of machine gun fire. Of course, I knew that I was coming back here where the explosions are part of a "celebration". Yuck. Also, fireworks upset my poodle. (and lots of dogs! )I know that may sound silly in light of what I just said, but it's not. So I've been known to go and politely ask neighbors to stop because "you're scaring my dog". Surprisingly, people have been pretty positive. Music, food, folks & fun.